Mit Blick auf die gesellschaftliche Relevanz von Medien und Bildung stehen theoretische Perspektiven und euphorische Utopien nicht selten praxisorientierten Projekten oder teils ernüchternden Erfahrungen aus dem pädagogischen Tagesgeschäft gegenüber. 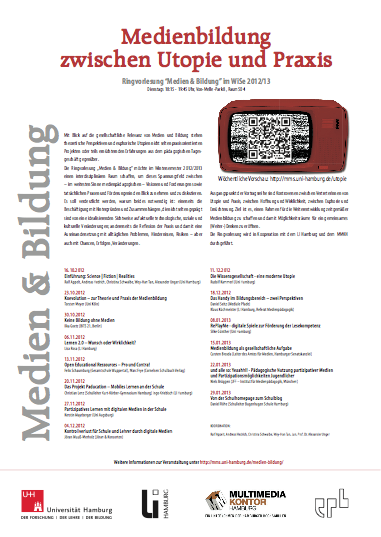 Die Ringvorlesung „Medien & Bildung“ möchte im Wintersemester 2012/2013 einen interdisziplinären Raum schaffen, um dieses Spannungsfeld zwischen – im weitesten Sinne medienpädagogischen – Visionen und Forderungen sowie tatsächlichen Praxen und Förderungen in den Blick zu nehmen und zu diskutieren. Es soll verdeutlicht werden, warum beides notwendig ist: einerseits die Beschäftigung mit Hintergründen und Zusammenhängen, die nicht selten geprägt sind von einer idealisierenden Sichtweise auf aktuelle technologische, soziale und kulturelle Veränderungen; andererseits die Reflexion der Praxis und damit eine Auseinandersetzung mit alltäglichen Problemen, Hindernissen, Risiken – aber auch mit Chancen, Erfolgen, Veränderungen. Johan Huizinga geht von einer engen, kausalen Verschränkung von Spiel und Kultur aus: Kultur ist Ergebnis früherer ritualisierter, verfestigter Spielhandlungen. Bestimmte Kulturen favorisieren bestimmte Spielmechanismen und Spielnarrationen; so fanden z.B. in mittelalterlichen bäuerlichen Kulturen eher Glücksspiele Anklang, da der Alltag von Fährnissen, Willkür und Unwägbarkeiten geprägt war, während der Adel Schach spielte, um spielerisch Kontrolle, Macht und Taktik zu erfahren (s. Udo Thiedecke „Spiel-Räume: Kleine Soziologie gesellschaftlicher Exklusionsbereiche“). Ankündigung und (Link)Liste der aufgezählten Spiele des Vortrags. One of mankinds greatest achievements is also one of its greatest obstacles in furthering the means to represent and thus reflect and understand ‚reality‘. Languages provides us with a seemingly simple way of assigning words to concepts to reality: Language, photographs, film, hypertext, games – all seem to be clear cut and distinguishable in their forms. All have a specific relationship to time and space in their acts of creation and those of reception. Language flows linearily, like a string of pearls coiling around the topic it tries to grasp, like the touches of a blind man trying to shape a sculpture out of thin air. Photography resembles an afterimage of a landscape illuminated by lightning, freezing a changing, moving world into one to behold in all it’s details, for once unchanging. Film moves our view like a puppet on a string, taking us relentlessly by the hand to follow what is laid out for us. Hypertext gives us some choice to choose between forking paths, maybe trace back and forth, like an idle or searching wanderer. And games – games provide us with language, images, moves, and choices, though it can not be found in these but in the rules that let us interpret them, interact with them. Games are what we turn into them by adding rules that differ from, yet resemble those given to us, ingrained in our identity and society. Mercifully, the first rule of a game is: You don’t have to play, and if you want to play you do not have to accept the rules as they are. This could also be seen as the first rule of all media, of all medium, but is never as clear as in games – or as in arts. One task suits both very well: Showing the limits and rules of media, of its beneficient and problematic potential, and that a word, a concept, a meaning, a rule system of production and reception, that these may may be altered by the artist, the game designer, the viewer, reader or player in an act of creation. Gamebooks were, during the 80ies and before the rise of PCs and the internet, a staple of interactive fiction. Back then, the next best thing to sitting together with some friends and playing a face-to-face roleplaying game was reading these branching, directed hypertexts in the form of books. Each paragraph had a number on top, and at the end there was the number of the next paragraph to be read. Sometimes a decision had to be made, e.g. doing something or refraining from it, that would lead to two different parapgraphs. Two medium-relevant motivations drove me, back then: I wanted to ’solve‘ the text, i.e. bringing the path to a satisfiying ending; and I wanted to know what would have happened if my decisions earlier on were different ones. 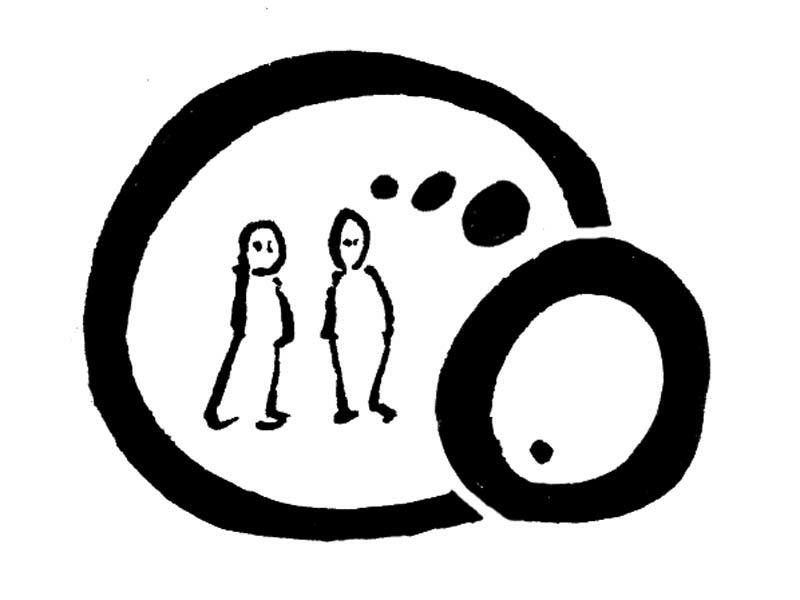 The latter one would usually take over when the text had been solved – a classic example for the replayability of a simplified narrative possibility space („The Tree“). Screenshot from the animation of the pathways of „The Mysterys of the Secret Room“. For a beautifully visualised and animated depiction of a reader’s possible paths of ten gamebooks, a description of specific path-formations, and an evolutionary analysis of „Choose your own adventures“ narrative structures – or if you simply had been a fan yourself in the heydays of gamebooks – visit this site: CYOA. „This ending was not just an easter egg for the obsessive reader who didn’t mind skimming every page looking for telltale words. Instead it’s hard to miss in even a casual riffling. 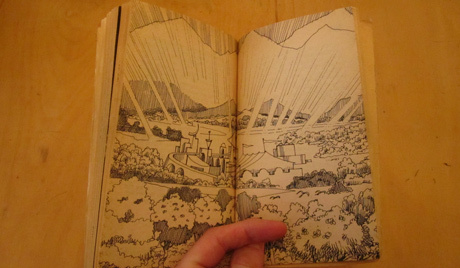 A two-page illustration showing what could only be paradise (or perhaps a theme park) leaps out as the only spread in the book without any text. Flipping to the page before brings you to 101, where you discover that your curiosity has been rewarded. Some things can’t be chosen from within the system of rules one adheres to, but has to be discovered or invented by breaking or transcending those boundaries. The modest artist/writer doesn’t explicitely states his name, but from the story presented I take it to be Steve Meretzky. 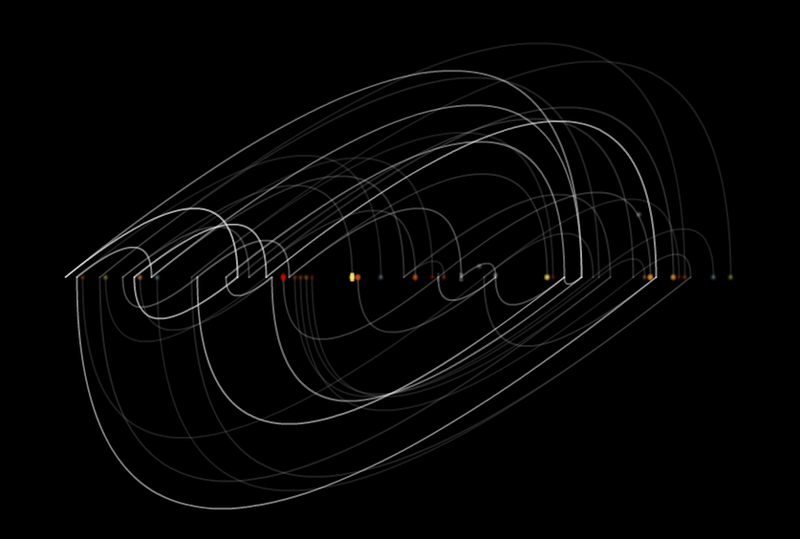 This is an extraordinary, and extraordinary beautiful website. 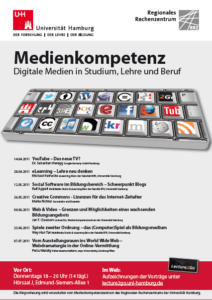 On tuesday, December 15th, from 18:00 to 19:30 I will give a lecture with the title „Spiele erster und zweiter Ordnung – Lernen zwischen Konvention und Innovation“ („First and second order games – Learning between convention and innovation“). I will present i.a. the concept of playing with a game’s boundaries, as a means of reflection on the medial nature of games and to challenge a critical view on the presentation of content. The framing is a cycle of lectures, „Games als Motor der Innovation“ („Games as motor of innovation“), held by gamecity at the HAW (University of applied sciences).